Download "SERIES FORMAT. Helping Others Help Themselves can be an excellent way to improve your ability to reach out to others"
3 in your personal and professional life. It can sharpen your sensitivity to the needs of others, increase your ability to effectively listen, show you how to be more accepting, teach you how to promote the growth of others or simply improve your ability to be a caring, humane, human being. We hope you find it a worthwhile experience. CHAPTERS IN THE SELF-STUDY PROGRAM This self-study program includes the following chapters: 1. The Helper and the Helping Process 2. The Initial Contact 3. Confidentiality 4. 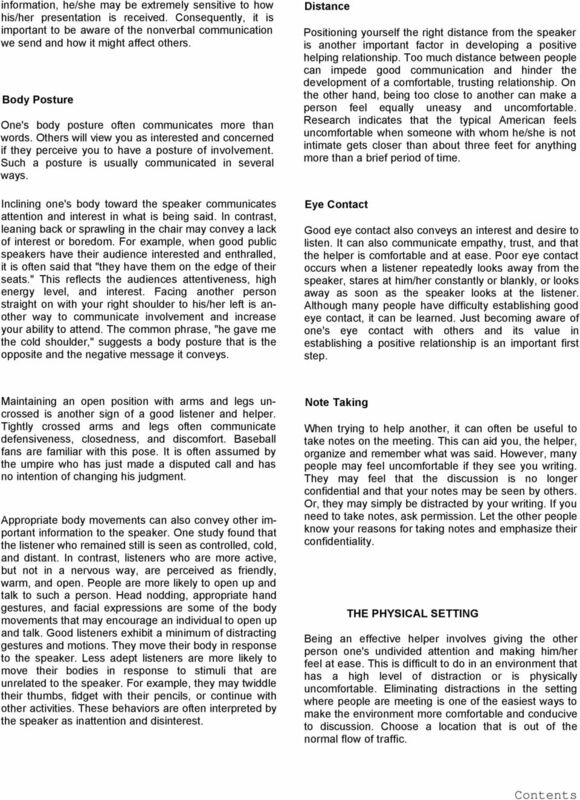 Nonverbal Behavior and the Physical Setting 5. 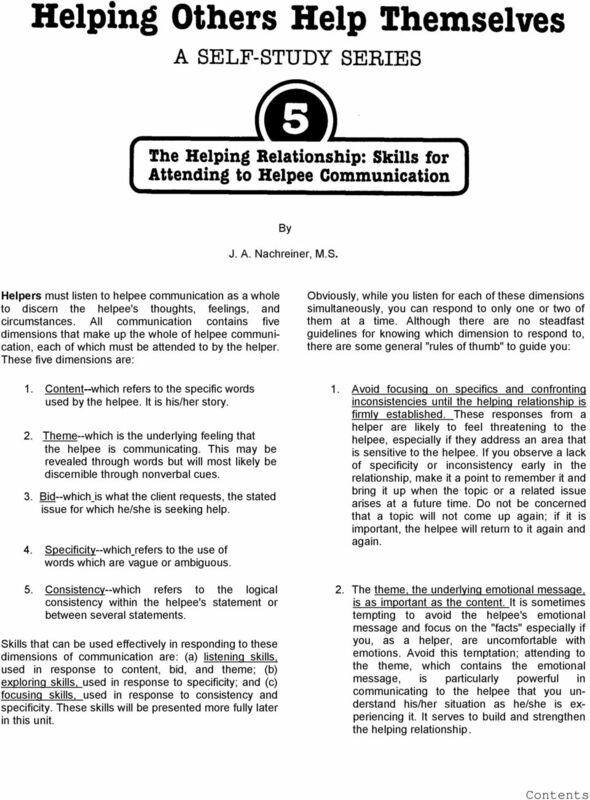 The Helping Relationship: Skills for Attending to Helpee Communication 6. Dealing with the Problem 7. Loss and Grief 8. Obstacles, Problems and Special Concerns 9. Making Referrals 10. Closure of the Helping Relationship 11. Organizing Community Support Groups 12. Preventing Helper Burnout Roger Williams, Ph.D. Associate Professor Health and Human Services Outreach University of Wisconsin-Madison J. A. Nachraeiner, M.S. 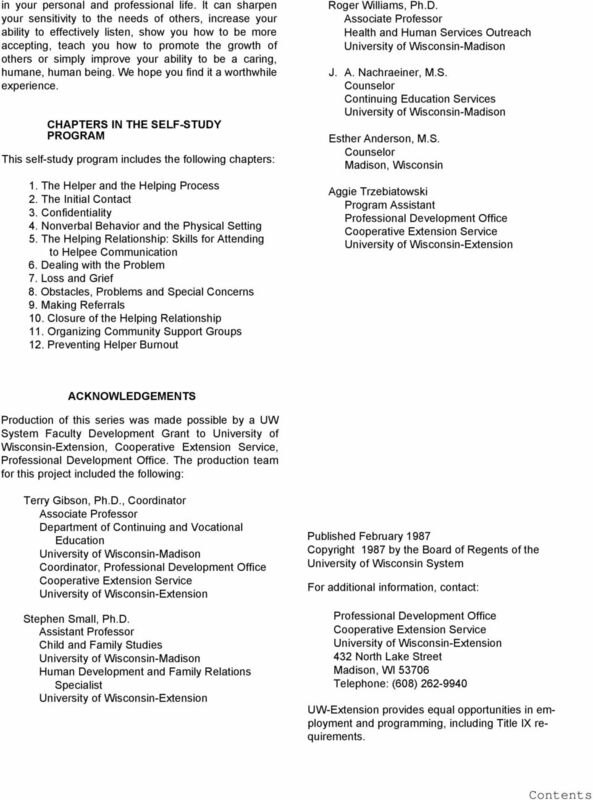 Counselor Continuing Education Services University of Wisconsin-Madison Esther Anderson, M.S. Counselor Madison, Wisconsin Aggie Trzebiatowski Program Assistant Professional Development Office Cooperative Extension Service University of Wisconsin-Extension ACKNOWLEDGEMENTS Production of this series was made possible by a UW System Faculty Development Grant to University of Wisconsin-Extension, Cooperative Extension Service, Professional Development Office. The production team for this project included the following: Terry Gibson, Ph.D., Coordinator Associate Professor Department of Continuing and Vocational Education University of Wisconsin-Madison Coordinator, Professional Development Office Cooperative Extension Service University of Wisconsin-Extension Stephen Small, Ph.D. Assistant Professor Child and Family Studies University of Wisconsin-Madison Human Development and Family Relations Specialist University of Wisconsin-Extension Published February 1987 Copyright 1987 by the Board of Regents of the University of Wisconsin System For additional information, contact: Professional Development Office Cooperative Extension Service University of Wisconsin-Extension 432 North Lake Street Madison, WI Telephone: (608) UW-Extension provides equal opportunities in employment and programming, including Title IX requirements. 4 By Stephen Small, Ph.D. THE GOAL OF HELPING One of the primary goals of a helping relationship is helping others help themselves. The problems and challenges people face are ultimately their own responsibility. In order for people to find workable solutions, they must accept this responsibility and recognize that change comes from within. Many people assume that someone else will solve their problems. Some people, for example, go to a professional counselor with the mistaken idea that the counselor will identify their problem and prescribe an easy solution. But an effective helper doesn't try to take over, rather he/she tries to empower other people to discover and use their own ability to manage their lives. Effective helpers may even work themselves out of a job, eventually discovering that they are no longer needed. To achieve this, helpers must believe that all people have worth, that they are capable of change and that they possess some personal strengths and abilities. They must trust that others can and will grow in their own time and in their own way. In trusting another, we are communicating our faith that they are capable, thereby enabling the helpee to believe this too. People who "care" so much for another that they become overly protective or allow the other to become dependent do not trust the person they care about. They may be responding more to their own needs than to the needs of the other person. 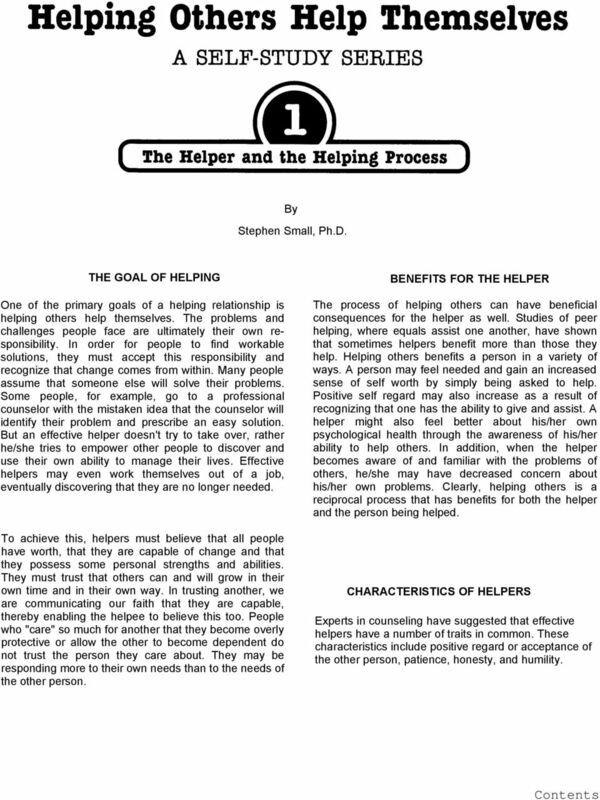 BENEFITS FOR THE HELPER The process of helping others can have beneficial consequences for the helper as well. Studies of peer helping, where equals assist one another, have shown that sometimes helpers benefit more than those they help. Helping others benefits a person in a variety of ways. A person may feel needed and gain an increased sense of self worth by simply being asked to help. Positive self regard may also increase as a result of recognizing that one has the ability to give and assist. A helper might also feel better about his/her own psychological health through the awareness of his/her ability to help others. In addition, when the helper becomes aware of and familiar with the problems of others, he/she may have decreased concern about his/her own problems. Clearly, helping others is a reciprocal process that has benefits for both the helper and the person being helped. 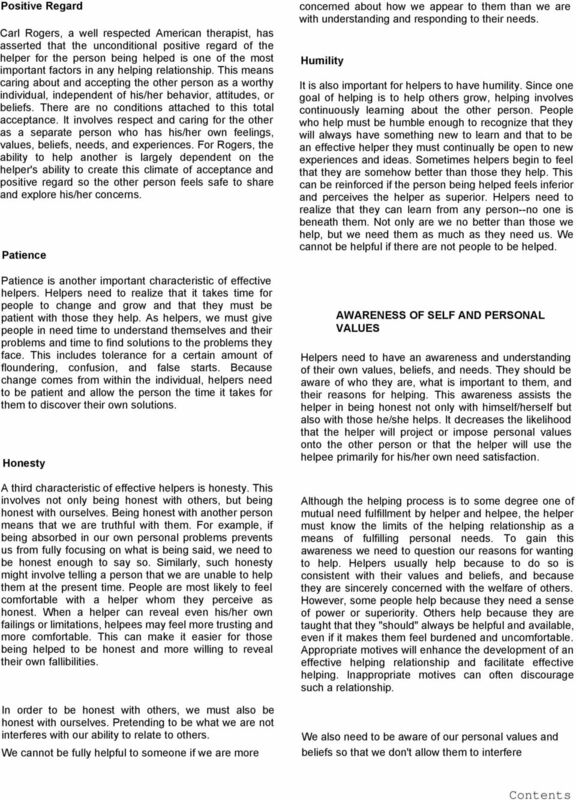 CHARACTERISTICS OF HELPERS Experts in counseling have suggested that effective helpers have a number of traits in common. These characteristics include positive regard or acceptance of the other person, patience, honesty, and humility. 6 with our ability to help. For instance, we might believe that abortion is wrong or that using illegal drugs is alright as long as it is done in the privacy of one's own home. Undoubtedly, in the course of our helping interactions with others, we will encounter people who have different values. If we want to help others, we must first attempt to understand their value systems and nonjudgmentally accept that they are acting in good faith within their own value system, even if those values differ from ours. We do not have to accept their values as our own or approve of them. But if we want to understand and help them, we must accept the fact that they hold the values that they do and not allow our own biases, beliefs, and values to interfere. We need to be nonjudgmental and accepting, regardless of how divergent our points of view might be. As helpers, it is our goal to empower others to help themselves, not to influence them to act and believe as we do. Of course this is not always easy to do and there may be times when our beliefs or values do not allow us to be objective, nonjudgmental helpers. In such cases, it may be best to let the people we are helping know that we may not be the best person to assist them with their problem. QUESTIONS TO CONSIDER When we are actively engaged in trying to be of help, we may become bogged down in the immediate details and become less aware of ourselves and whether we are doing our best. Under the pressures of the moment we often forget what is important. It can be beneficial to occasionally take some time to remind ourselves of what we are doing and to assess whether we are doing it well. 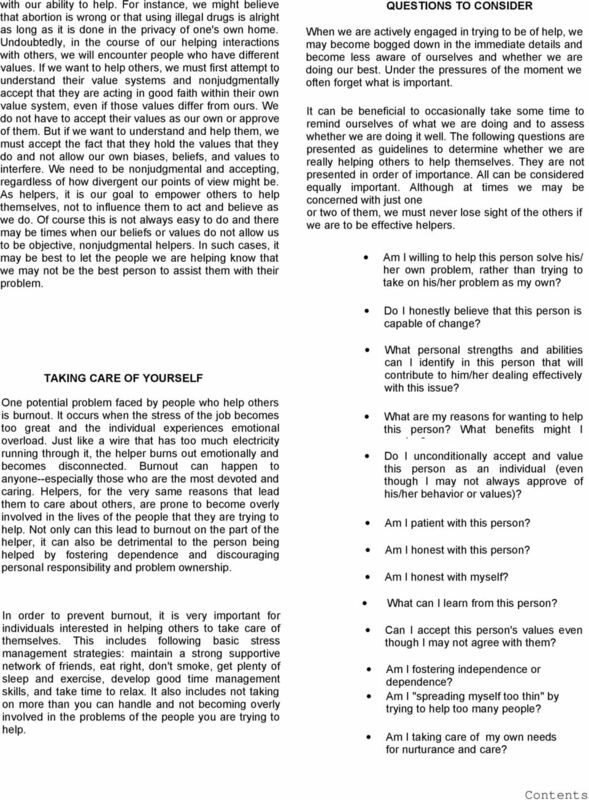 The following questions are presented as guidelines to determine whether we are really helping others to help themselves. They are not presented in order of importance. All can be considered equally important. Although at times we may be concerned with just one or two of them, we must never lose sight of the others if we are to be effective helpers. Am I willing to help this person solve his/ her own problem, rather than trying to take on his/her problem as my own? Do I honestly believe that this person is capable of change? TAKING CARE OF YOURSELF One potential problem faced by people who help others is burnout. It occurs when the stress of the job becomes too great and the individual experiences emotional overload. Just like a wire that has too much electricity running through it, the helper burns out emotionally and becomes disconnected. Burnout can happen to anyone--especially those who are the most devoted and caring. Helpers, for the very same reasons that lead them to care about others, are prone to become overly involved in the lives of the people that they are trying to help. Not only can this lead to burnout on the part of the helper, it can also be detrimental to the person being helped by fostering dependence and discouraging personal responsibility and problem ownership. In order to prevent burnout, it is very important for individuals interested in helping others to take care of themselves. This includes following basic stress management strategies: maintain a strong supportive network of friends, eat right, don't smoke, get plenty of sleep and exercise, develop good time management skills, and take time to relax. It also includes not taking on more than you can handle and not becoming overly involved in the problems of the people you are trying to help. What personal strengths and abilities can I identify in this person that will contribute to him/her dealing effectively with this issue? What are my reasons for wanting to help this person? What benefits might I receive? Do I unconditionally accept and value this person as an individual (even though I may not always approve of his/her behavior or values)? Am I patient with this person? Am I honest with this person? Am I honest with myself? What can I learn from this person? Can I accept this person's values even though I may not agree with them? Am I fostering independence or dependence? Am I "spreading myself too thin" by trying to help too many people? Am I taking care of my own needs for nurturance and care? 7 ACTIVITIES FOR FURTHER LEARNING Activity: Gaining Insight Into Yourself as a Helper The purpose of this activity is to help you gain insight into your motives for helping, your personal strengths and weaknesses as a helper, and how your personal values and biases can affect your ability to help others. Think about a past situation where you tried to help another person and answer the following questions. Try to be as honest with yourself as possible. I What were your motives for helping this person? Did you benefit from this relationship in any way? How? What was your role in the helping relationship? In what way do you think you helped this person? Looking back, is there anything that you might have done differently? Was there anything that this person did, said or believed that you did not agree with? How did you react? 5. Did you learn anything from this relationship? From the person you helped? SUGGESTIONS FOR FURTHER READING Brammer, L. M. (1973). The helping relationship. Englewood Cliffs: Prentice-Hall. Dass, R.; & Gorman, P. (1985). How can I help? New York: Knopf. Mahoney, S. C. (1967). The art of helping people effectively. New York: Association Press. Mayeroff, M. (1971). On caring. New York: Harper and Row. Rogers, C. R. (1967). On becoming a person. Boston: Houghton Mifflin. Scheffler, L. W. (1984). Help thy neighbor. New York: Grove Press. Wicks, R. J. (1979). Chilton Book Co. Helping others. Radnor, PA: Stephen Small, Ph.D., Assistant Professor of Child and Family Studies, University of Wisconsin-Madison, and Human Development and Family Relations Specialist, University of Wisconsin-Extension. 9 Active listening is basic in establishing a helping relationship. This response is the primary response used during the initial contact. You will continue to rely heavily on active listening for the duration of the helping relationship. It allows the helper to understand what the person is experiencing and allows that person to talk openly and honestly without fear of how the helper will react. Most importantly, it helps the other person to feel accepted, understood, and unjudged. MAINTAINING AND FOSTERING HELPEE SELF-ESTEEM Self-esteem is a person's most valuable asset. Without it, growth is merely an accident. With it, virtually any crisis is eventually manageable. A crucial role of the helper is to foster and maintain self-esteem. Active listening contributes to the self-esteem of the helpee. However, the helpee's self-esteem, how he/she feels about his/her worth as a human being, is probably suffering. Seeking assistance for personal problems is somewhat of a taboo in this country. If a person feels distressed enough to violate this taboo and seek help, he/she may be feeling inadequate and is probably having self-doubts about his/her worth. He/she may even feel like a failure. These feelings demand special and sensitive attention. 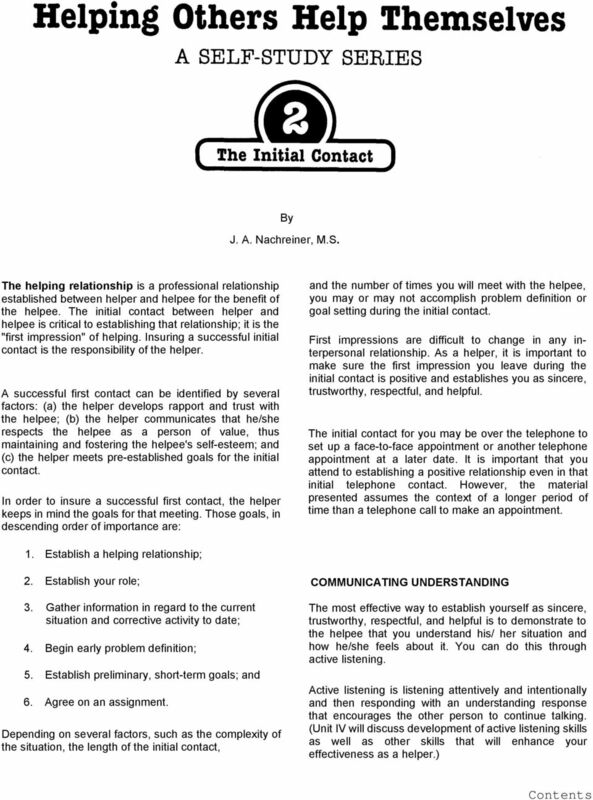 ESTABLISHING YOUR ROLE AS HELPER The main purpose of the initial contact remains the establishment of the helping relationship as one based on understanding, acceptance, trust and respect. The initial contact sets the tone for future encounters. To set the tone of trust and mutual respect, you will want to establish your role as helper early in the relationship. To establish your role, simply state how you can and cannot help. For example, "I can help you to define and clarify your source of distress and develop an action plan for dealing with your problem. I cannot make changes for you or force you to make changes you don't want to make." This is also a good time to clarify expectations. Tell helpees what you expect from them and what they can expect from you. For example, will you assign "homework?" If so, you expect their commitment in completing that assignment. Can they expect confidentiality from you? If so, tell them. Remember, this is occurring in the context of establishing a relationship. As you work to establish your role, discuss the helpee's approval, concerns, misconceptions, and expectations. He/she undoubtedly had preconceived notions about your role. Now is the time to clarify expectations and develop mutual understanding. During times of crisis, people tend to question that which is important to them, their values. These values are typically critical to their identity and self-worth. As a helper, you can reinforce the worth of the helpee's values and, consequently, affirm his/her worth. An example of this kind of affirmation is: I can tell that (state the value, i.e., being dependable) is really important to you. That's a part of you that you will take with you into the future, too. GATHERING INFORMATION Having completed the "housekeeping" chore of defining your role, you proceed to deal with the purpose of your being together. As a helper, you need to understand the helpee's current situation as he/she sees it. You want to learn as much about the what, when, how, where, and why of the situation as possible. It is also helpful to know how the helpee has attempted to change the situation. Again, rely on active listening skills to gather this information. When a person is experiencing low self-esteem, he/ she is apt to focus on the unsuccessful aspects of his/her efforts. In your active listening responses, you can include feedback that invites the helpee to be aware of his/her worth that he/she is overlooking. An example would be: During this time we've been talking, I noticed that in spite of all that's happening and how difficult it is for you, you have still (state the reported success, i.e., you have still been able to give support and encouragement to your spouse). There is a tendency to rush this part of the helping process. Deny this tendency. It is difficult to overemphasize the importance of sufficient information to accurate problem definition and goal setting. Frequently, helpees state one problem early in the relationship which is only a consequence of a larger, more encompassing problem. (This situation is explored in greater depth in Unit V.) Thorough information will allow you to avoid pitfalls later. 10 DEFINING THE PROBLEM While gathering information, the problem(s) with which the helpee needs assistance emerges. Again, active listening skills are the helper's tool in defining the helpee's problem. Use these tools to aid the helpee in telling his/her story. As an active listener during information gathering, you gradually come to understand and appreciate the helpee's situation as he/she experiences it. As a trained helper, you maintain the distance necessary to aid the helpee in viewing that situation from other perspectives. From your involved, yet simultaneously detached position, you can assist in formulating preliminary problem definitions. However, these preliminary definitions should be regarded as hypotheses; their validity needs to be checked out through interaction between you and the helpee. As the helping process continues and the issue is explored more thoroughly, these definitions may need to be revised or refined. ESTABLISHING SHORT-TERM GOALS Whether or not you and the person seeking help agree on a problem definition during the initial contact, you will want to establish short-term goals. Without a problem definition, these goals may be as simple as setting an agenda for your next meeting. For example, "When we meet next week, let's talk more about (any issue which requires further exploration)." If you and the helpee have generated a problem definition, you may want to establish some preliminary goals for overcoming that problem along with short term goals. For example, if the problem has been defined as spending in excess of income, a realistic preliminary goal may be to record every expenditure for a month with meetings set up weekly to review those expenditures and to generate options for reducing expenditures. The goal setting process is ongoing. As you refine the problem definition, goals become more specific and, most likely, more demanding. 2. The proactive involvement of the helpee serves to empower that person; he/she is an active agent in applying and learning the process which is useful now and in the future. Helping is not something done to or for him/her. 3. Assignments also assist helpees in making gradual, manageable progress toward change. Whether you use assignments as a helping tool is obviously at your discretion. You may also choose to use them in some instances and not in others. As with much of helping, this is an area requiring some experimentation consistent with your personal style and the helpee's personality and situation. This unit reviews, in a very broad way, the initial contact phase of the helping process. While the helpee can realistically establish a series of goals during this contact, this must be accomplished in the context of establishing a trusting, respectful, helping relationship. Without the basis of a strong relationship, all the other work of helping will be impaired. A strong helping relationship establishes the climate for a strong helping outcome. 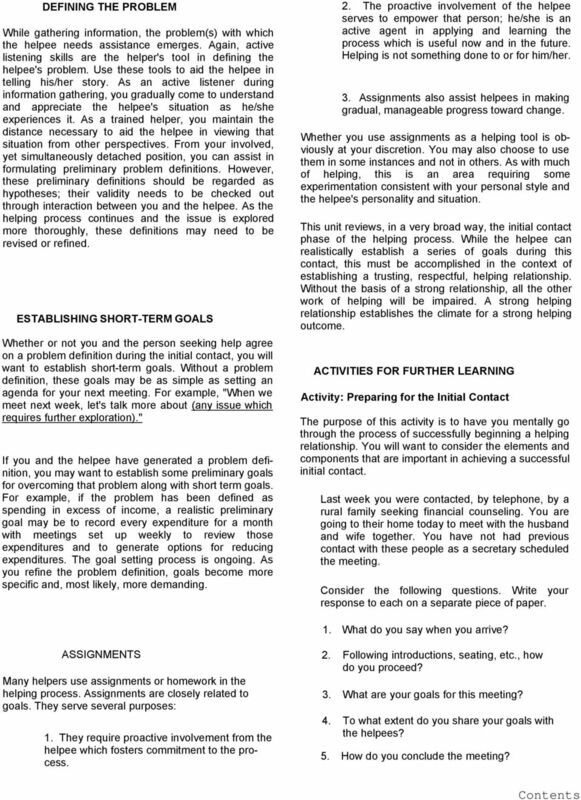 ACTIVITIES FOR FURTHER LEARNING Activity: Preparing for the Initial Contact The purpose of this activity is to have you mentally go through the process of successfully beginning a helping relationship. You will want to consider the elements and components that are important in achieving a successful initial contact. Last week you were contacted, by telephone, by a rural family seeking financial counseling. You are going to their home today to meet with the husband and wife together. You have not had previous contact with these people as a secretary scheduled the meeting. Consider the following questions. Write your response to each on a separate piece of paper. 1. What do you say when you arrive? ASSIGNMENTS Many helpers use assignments or homework in the helping process. Assignments are closely related to goals. They serve several purposes: 1. They require proactive involvement from the helpee which fosters commitment to the process. 2. Following introductions, seating, etc., how do you proceed? 3. What are your goals for this meeting? 4. To what extent do you share your goals with the helpees? 5. How do you conclude the meeting? 11 SUGGESTIONS FOR FURTHER READING Brammer, L. M. (1979). 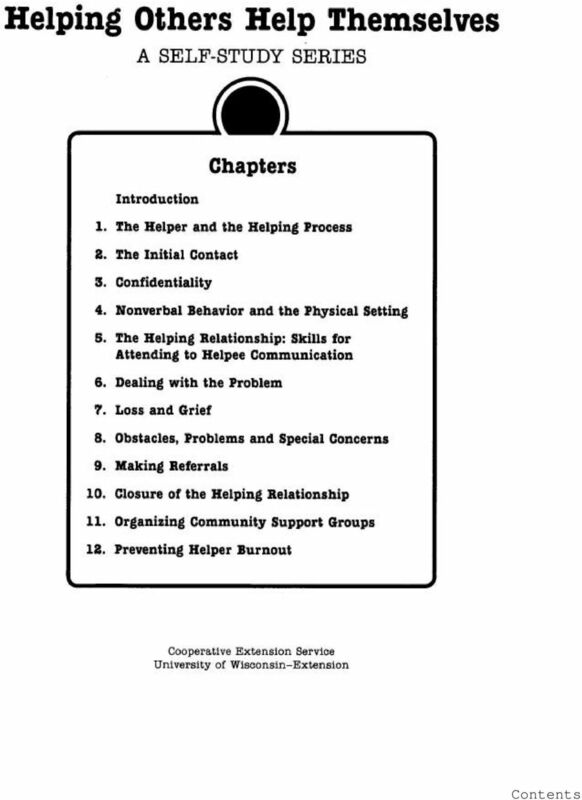 The helping relationship: Process and skills (Chapter 3) (2nd ed.). Englewood Cliffs: Prentice Hall, Inc. Lee, J. L.; Pulvino, C. J.; & Forman, C. E. (1984). Communication skills for financial planners (Chapter I). Instructional Enterprises. 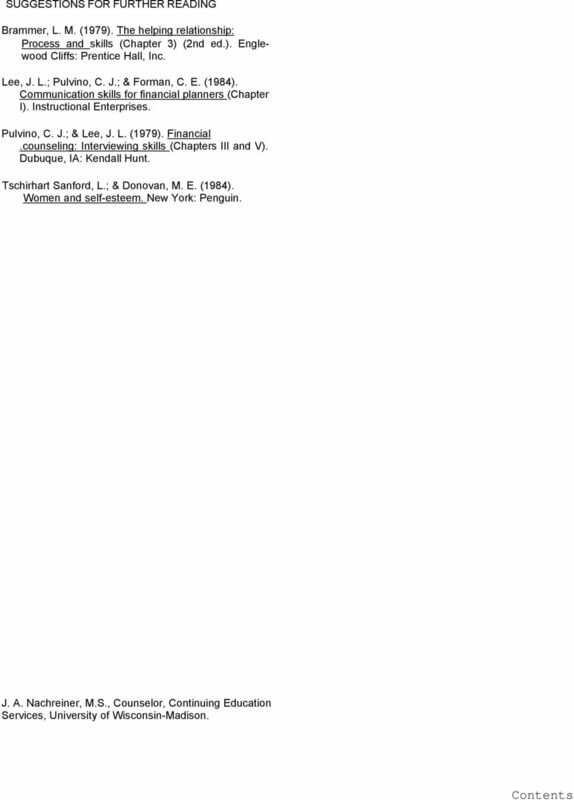 Pulvino, C. J.; & Lee, J. L. (1979). Financial.counseling: Interviewing skills (Chapters III and V). Dubuque, IA: Kendall Hunt. Tschirhart Sanford, L.; & Donovan, M. E. (1984). Women and self-esteem. New York: Penguin. J. A. Nachreiner, M.S., Counselor, Continuing Education Services, University of Wisconsin-Madison. 12 By J. A. Nachreiner, M.S. 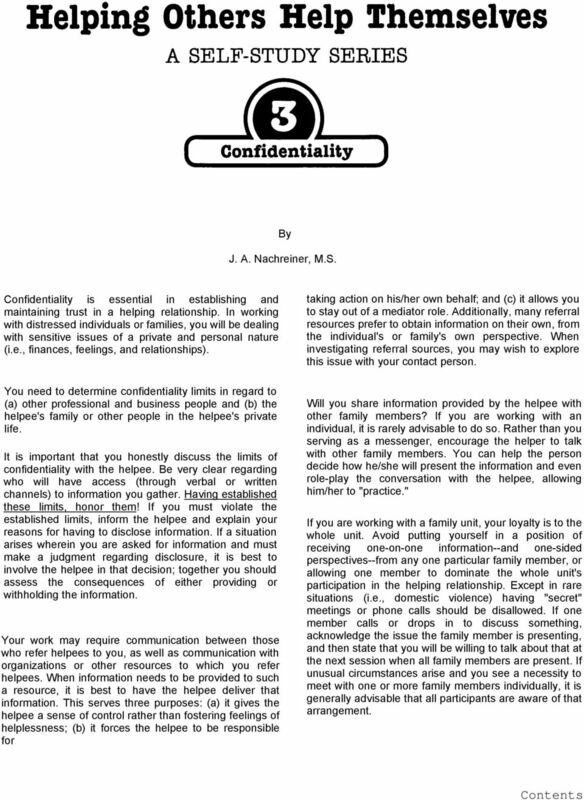 Confidentiality is essential in establishing and maintaining trust in a helping relationship. In working with distressed individuals or families, you will be dealing with sensitive issues of a private and personal nature (i.e., finances, feelings, and relationships). You need to determine confidentiality limits in regard to (a) other professional and business people and (b) the helpee's family or other people in the helpee's private life. It is important that you honestly discuss the limits of confidentiality with the helpee. Be very clear regarding who will have access (through verbal or written channels) to information you gather. Having established these limits, honor them! If you must violate the established limits, inform the helpee and explain your reasons for having to disclose information. If a situation arises wherein you are asked for information and must make a judgment regarding disclosure, it is best to involve the helpee in that decision; together you should assess the consequences of either providing or withholding the information. Your work may require communication between those who refer helpees to you, as well as communication with organizations or other resources to which you refer helpees. When information needs to be provided to such a resource, it is best to have the helpee deliver that information. This serves three purposes: (a) it gives the helpee a sense of control rather than fostering feelings of helplessness; (b) it forces the helpee to be responsible for taking action on his/her own behalf; and (c) it allows you to stay out of a mediator role. Additionally, many referral resources prefer to obtain information on their own, from the individual's or family's own perspective. When investigating referral sources, you may wish to explore this issue with your contact person. Will you share information provided by the helpee with other family members? If you are working with an individual, it is rarely advisable to do so. Rather than you serving as a messenger, encourage the helper to talk with other family members. You can help the person decide how he/she will present the information and even role-play the conversation with the helpee, allowing him/her to "practice." If you are working with a family unit, your loyalty is to the whole unit. Avoid putting yourself in a position of receiving one-on-one information--and one-sided perspectives--from any one particular family member, or allowing one member to dominate the whole unit's participation in the helping relationship. Except in rare situations (i.e., domestic violence) having "secret" meetings or phone calls should be disallowed. If one member calls or drops in to discuss something, acknowledge the issue the family member is presenting, and then state that you will be willing to talk about that at the next session when all family members are present. If unusual circumstances arise and you see a necessity to meet with one or more family members individually, it is generally advisable that all participants are aware of that arrangement. 13 There is, of course, the possibility of an immediate crisis (i.e., a suicide attempt) that clearly requires you to sacrifice confidentiality and does not permit you to process that decision with the helpee. Except in rare and extreme situations, be true to your parameters of confidentiality. It is part of the core of the helping relationship. ACTIVITIES FOR FURTHER LEARNING Activity: Gaining Skills Surrounding Confidentiality Issues The purpose of this activity is to give you experience in considering the issues involved with confidentiality, as well as helping you to clarify the criteria you will use in making judgments regarding confidentiality. Consider how you will handle the issue of confidentiality in the following situations. List the considerations involved and the consequences of maintaining confidentiality and of breaking confidentiality in each case. her parents. She has not been to a clinic. She is not sure who the baby's father is as she has been dating two boys for the past few months. An at home pregnancy test has supplied one positive and one negative result. How do you handle the issue of confidentiality? 4. You are making an on-farm visit. You and the husband are in the barn. The wife comes in to help with milking. Her face is bruised badly and there is a cut above her eye. She is embarrassed when you ask what happened. Her husband is angry toward her, telling her to go back to the house. He can handle milking without her. His attitude toward you grows cold and distant. He offers an explanation of a fall for his wife's bruised and cut face. You comment that it must have been a nasty fall and ask whether she saw a doctor. The husband breaks into tears and confides that he pushed his wife down the stairs. How do you handle the issue of confidentiality in this situation? 1. A young woman, who recently attended one of your parenting classes, calls you at your office. She makes a routine inquiry but seems hesitant to hang up. You sense she wants to say more but is reluctant to do so. In an effort to help her feel comfortable, you ask her about her children. During the course of the conversation the woman confides that she is concerned she may have hurt her three-year-old son earlier in the day. How do you handle the issue of confidentiality in this case? 2. You are helping a couple with their personal financial problems. You've always met with them together. One afternoon you receive a call from the husband who tells you his wife has been lying about the amount of money they spend on entertainment. He confides that her favorite form of entertainment is drinking and that they spend considerably more on liquor than indicated in their entertainment figure. He implores you not to use this information in the financial analysis, though; his wife would be irate if she knew he made this call. How do you handle his request for confidentiality? 3. A teenage girl confides in you that she thinks she is pregnant. She has not told J. A. Nachreiner, M.S., Counselor, Continuing Education Services, University of Wisconsin-Madison. 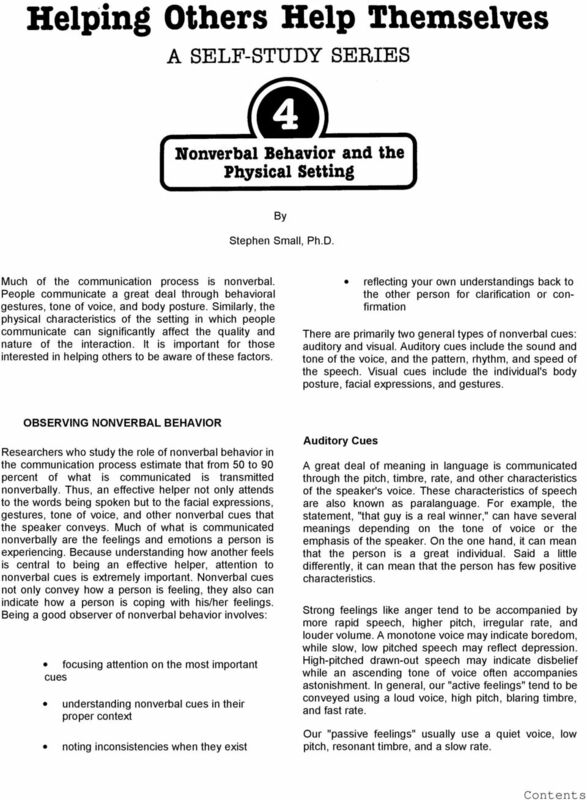 14 By Stephen Small, Ph.D. Much of the communication process is nonverbal. People communicate a great deal through behavioral gestures, tone of voice, and body posture. Similarly, the physical characteristics of the setting in which people communicate can significantly affect the quality and nature of the interaction. It is important for those interested in helping others to be aware of these factors. reflecting your own understandings back to the other person for clarification or confirmation There are primarily two general types of nonverbal cues: auditory and visual. Auditory cues include the sound and tone of the voice, and the pattern, rhythm, and speed of the speech. Visual cues include the individual's body posture, facial expressions, and gestures. OBSERVING NONVERBAL BEHAVIOR Researchers who study the role of nonverbal behavior in the communication process estimate that from 50 to 90 percent of what is communicated is transmitted nonverbally. Thus, an effective helper not only attends to the words being spoken but to the facial expressions, gestures, tone of voice, and other nonverbal cues that the speaker conveys. Much of what is communicated nonverbally are the feelings and emotions a person is experiencing. Because understanding how another feels is central to being an effective helper, attention to nonverbal cues is extremely important. Nonverbal cues not only convey how a person is feeling, they also can indicate how a person is coping with his/her feelings. Being a good observer of nonverbal behavior involves: focusing attention on the most important cues understanding nonverbal cues in their proper context noting inconsistencies when they exist Auditory Cues A great deal of meaning in language is communicated through the pitch, timbre, rate, and other characteristics of the speaker's voice. These characteristics of speech are also known as paralanguage. For example, the statement, "that guy is a real winner," can have several meanings depending on the tone of voice or the emphasis of the speaker. On the one hand, it can mean that the person is a great individual. Said a little differently, it can mean that the person has few positive characteristics. Strong feelings like anger tend to be accompanied by more rapid speech, higher pitch, irregular rate, and louder volume. A monotone voice may indicate boredom, while slow, low pitched speech may reflect depression. High-pitched drawn-out speech may indicate disbelief while an ascending tone of voice often accompanies astonishment. In general, our "active feelings" tend to be conveyed using a loud voice, high pitch, blaring timbre, and fast rate. Our "passive feelings" usually use a quiet voice, low pitch, resonant timbre, and a slow rate. 16 information, he/she may be extremely sensitive to how his/her presentation is received. Consequently, it is important to be aware of the nonverbal communication we send and how it might affect others. Body Posture One's body posture often communicates more than words. Others will view you as interested and concerned if they perceive you to have a posture of involvement. Such a posture is usually communicated in several ways. Inclining one's body toward the speaker communicates attention and interest in what is being said. In contrast, leaning back or sprawling in the chair may convey a lack of interest or boredom. For example, when good public speakers have their audience interested and enthralled, it is often said that "they have them on the edge of their seats." This reflects the audiences attentiveness, high energy level, and interest. Facing another person straight on with your right shoulder to his/her left is another way to communicate involvement and increase your ability to attend. The common phrase, "he gave me the cold shoulder," suggests a body posture that is the opposite and the negative message it conveys. Distance Positioning yourself the right distance from the speaker is another important factor in developing a positive helping relationship. Too much distance between people can impede good communication and hinder the development of a comfortable, trusting relationship. On the other hand, being too close to another can make a person feel equally uneasy and uncomfortable. Research indicates that the typical American feels uncomfortable when someone with whom he/she is not intimate gets closer than about three feet for anything more than a brief period of time. Eye Contact Good eye contact also conveys an interest and desire to listen. It can also communicate empathy, trust, and that the helper is comfortable and at ease. Poor eye contact occurs when a listener repeatedly looks away from the speaker, stares at him/her constantly or blankly, or looks away as soon as the speaker looks at the listener. Although many people have difficulty establishing good eye contact, it can be learned. Just becoming aware of one's eye contact with others and its value in establishing a positive relationship is an important first step. Maintaining an open position with arms and legs uncrossed is another sign of a good listener and helper. Tightly crossed arms and legs often communicate defensiveness, closedness, and discomfort. Baseball fans are familiar with this pose. It is often assumed by the umpire who has just made a disputed call and has no intention of changing his judgment. Appropriate body movements can also convey other important information to the speaker. One study found that the listener who remained still is seen as controlled, cold, and distant. In contrast, listeners who are more active, but not in a nervous way, are perceived as friendly, warm, and open. People are more likely to open up and talk to such a person. Head nodding, appropriate hand gestures, and facial expressions are some of the body movements that may encourage an individual to open up and talk. Good listeners exhibit a minimum of distracting gestures and motions. They move their body in response to the speaker. Less adept listeners are more likely to move their bodies in response to stimuli that are unrelated to the speaker. For example, they may twiddle their thumbs, fidget with their pencils, or continue with other activities. These behaviors are often interpreted by the speaker as inattention and disinterest. Note Taking When trying to help another, it can often be useful to take notes on the meeting. This can aid you, the helper, organize and remember what was said. However, many people may feel uncomfortable if they see you writing. They may feel that the discussion is no longer confidential and that your notes may be seen by others. Or, they may simply be distracted by your writing. If you need to take notes, ask permission. Let the other people know your reasons for taking notes and emphasize their confidentiality. THE PHYSICAL SETTING Being an effective helper involves giving the other person one's undivided attention and making him/her feel at ease. This is difficult to do in an environment that has a high level of distraction or is physically uncomfortable. Eliminating distractions in the setting where people are meeting is one of the easiest ways to make the environment more comfortable and conducive to discussion. Choose a location that is out of the normal flow of traffic. 17 If the person seeking help doesn't feel that the area is private, he/she may be hesitant to open up, out of fear that what is being discussed will be overheard by others. Try to minimize interruptions and distractions by informing others in your office such as colleagues or secretaries that you do not want to be disturbed. If it is possible, take the phone off the hook. The physical layout and climate of a setting can also influence the helping situation. A room that is well ventilated, has sufficient lighting, and is a comfortable temperature is best. A less comfortable room may make people drowsy, cold, or restless and, consequently, less willing to stay and talk. How a room is arranged can also affect the helping relationship. For example, many people feel threatened when the helper is sitting behind a desk. Thus, it is usually a good idea to eliminate physical barriers between those who are present. If it is necessary to have a hard writing surface, a round table is probably the most conducive to working with others on an equal basis. A relaxed setting with comfortable furniture such as a couch and stuffed chair arranged so that people are sitting at a comfortable social and working distance from one another usually works best. Finally, whenever possible, the helpee should be given the option of where to sit. When you are meeting with someone in their own home or place of work, these factors are not always in your control. In such cases you may want to suggest that you meet in the kitchen, living room, or dining area. Try to meet in a location that is relatively private with few distractions. If there are potential sources of noise and distraction, try to eliminate them. For example, suggest that the television be turned off or that the washing machine not be turned on until you are finished meeting. You may also want to meet at a time when you know there will be few interruptions or distractions. For instance, your meeting will probably be quieter and have fewer interruptions if you meet after the children leave for school rather than when they first arrive home. In general, try to follow the lead of the family. Do what makes them feel most comfortable and at ease. Finally, regardless of where you meet, be sure that you have enough time to discuss the issues of concern in adequate depth. A great deal of the helping process involves nonverbal behavior. it is important for helpers to be sensitive to these cues and to use them when working with others. People can become more effective helpers if they listen not only with their ears but also with their eyes, head, and heart. ACTIVITIES FOR FURTHER LEARNING Activity I: Becoming More Aware of Your Own Nonverbal Cues The purpose of this exercise is to help you become more aware of your own nonverbal cues and the messages that they convey to others. In order to do this activity, you will need to enlist the help of someone who will serve as an observer, and an individual who will participate in a discussion with you while the observer is present. A. Have the observer watch you while you have a discussion with another individual. The topic should be important to you and the discussion should last for at least five or six minutes. B. Have the observer pay attention to your body posture, eye contact, hand gestures, mannerisms, and tone of voice. Ask the observer to record his/her observations in writing. C. Discuss with the Observer his/her observations, taking note of both positive and negative nonverbal cues. D. Consider the following questions: 1. Did you exhibit any mannerisms or gestures which you were not aware of? 2. Was your eye contact adequate? 3. Overall, what kind of impression did you convey to the observer? Did you appear relaxed? Uptight? Rigid? Interested? 4. Was your voice tone appropriate given the topic of the discussion? Did you express too little or too much emotion? 5. Were you conscious or aware of the non verbal cues you were exhibiting? Activity 11: Becoming Aware of and Interpreting Nonverbal Cues The purpose of this exercise is to help you recognize nonverbal cues and to give you practice in interpreting them. 18 In order to do this activity you will need access to a VCR and a videotape. Read through all of the following instructions before doing this exercise. A. Select a favorite television program that has a plot and tape it. B. The first time you watch the program, view it with the sound off. C. Try to describe the plot as you understand it. D. What behaviors were critical to your understanding of the story? E. What messages did these behaviors convey? F. How were the characters feeling? What nonverbal behaviors did they exhibit that led you to conclude this? G. After completing the above, view the program again; this time turn on the sound. H. How accurate was your interpretation of the plot and the feelings of the characters? I. Were there some nonverbal cues that were confusing or unclear? What were they? Why do you think they were confusing or difficult to interpret? J. Which nonverbal cues were the easiest to interpret? SUGGESTIONS FOR FUTURE READING Argyle, M. (1975). Bodily communication. New York: International Universities Press. Bolton, R. (1979). People skills. Englewood Cliffs: Prentice-Hall. Egan, G. (1982). The skilled helper. Monterey, CA: Brooks/Cole. Eisenberg, A., & Smith, R. R. (1971). Nonverbal communication. New York: Bobbs-Merrill Knapp, M. (1978). 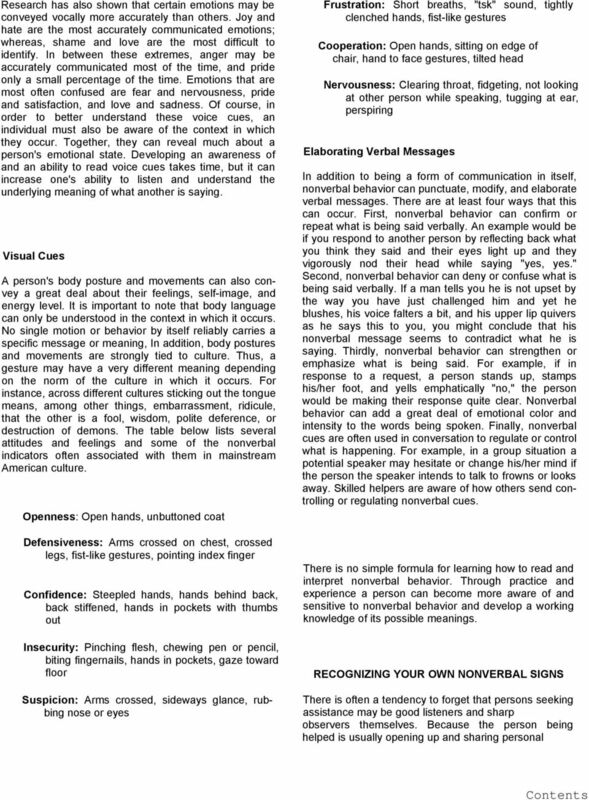 Nonverbal communication in human interaction. New York: Holt, Rhinehart & Winston. Rosenfeld, L. (1976). With words unspoken. Chicago: Holt, Rinehart, & Winston, Stephen Small, Ph.D., Assistant Professor of Child and Family Studies, University of Wisconsin-Madison, and Human Development and Family Relations Specialist, University of Wisconsin-Extension. 19 By J. A. Nachreiner, M.S. 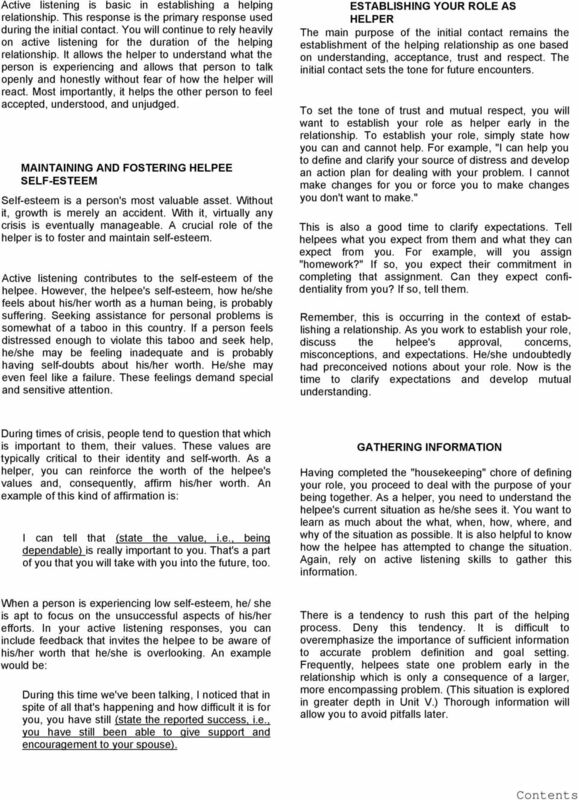 Helpers must listen to helpee communication as a whole to discern the helpee's thoughts, feelings, and circumstances. All communication contains five dimensions that make up the whole of helpee communication, each of which must be attended to by the helper. These five dimensions are: 1. Content--which refers to the specific words used by the helpee. It is his/her story. 2. Theme--which is the underlying feeling that the helpee is communicating. This may be revealed through words but will most likely be discernible through nonverbal cues. 3. Bid--which is what the client requests, the stated issue for which he/she is seeking help. 4. Specificity--which refers to the use of words which are vague or ambiguous. 5. Consistency--which refers to the logical consistency within the helpee's statement or between several statements. Skills that can be used effectively in responding to these dimensions of communication are: (a) listening skills, used in response to content, bid, and theme; (b) exploring skills, used in response to specificity; and (c) focusing skills, used in response to consistency and specificity. These skills will be presented more fully later in this unit. Obviously, while you listen for each of these dimensions simultaneously, you can respond to only one or two of them at a time. Although there are no steadfast guidelines for knowing which dimension to respond to, there are some general "rules of thumb" to guide you: 1. Avoid focusing on specifics and confronting inconsistencies until the helping relationship is firmly established. These responses from a helper are likely to feel threatening to the helpee, especially if they address an area that is sensitive to the helpee. If you observe a lack of specificity or inconsistency early in the relationship, make it a point to remember it and bring it up when the topic or a related issue arises at a future time. Do not be concerned that a topic will not come up again; if it is important, the helpee will return to it again and again. 2. The theme, the underlying emotional message, is as important as the content. It is sometimes tempting to avoid the helpee's emotional message and focus on the "facts" especially if you, as a helper, are uncomfortable with emotions. Avoid this temptation; attending to the theme, which contains the emotional message, is particularly powerful in communicating to the helpee that you understand his/her situation as he/she is experiencing it. It serves to build and strengthen the helping relationship. These skills are presented as a hierarchy that is organized within a systematic framework. Humans pride themselves on their seemingly unique ability to verbalize feelings and ideas. TIDELANDS COUNSELING CINDY STRICKLEN, M.S., I.M.F. LICENSE #61293 1411 Marsh Street Suite 105, San Luis Obispo, CA 93401 Minor Consent for Treatment and Service Agreement Welcome to Tidelands Counseling! Why Be Aware of Professional Presence? County of Yuba Customer Service Examination Study Guide The following study guide will familiarize and assist you with preparing for a written examination containing multiple-choice customer service items. Was it difficult for you to pick up this book? Is it hard even to consider if you. Am I experiencing. Am I an abused woman? apter 1 1 Am I experiencing I didn t see myself as an abused woman. The only images I had came from television. I thought of abused women as weak, quiet and less educated women who were battered and bruised. Communication Skills: Lecture No.5 Module 3 Lecture 1 Non-Verbal Communication Hello and welcome back to NPTEL s course on communication skills! We have a very interesting module at hand Non-verbal Communication. MEDICAL ASSISTANT : COMMUNICATION WITH PATIENTS. Their stories are tragic. A new chapter starts now. now.
! Their stories are tragic. A new chapter starts now. now.! Bully is a movie that tells powerful stories about children and their families dealing with extreme pain and tragic consequences related to bullying. Body language. Most men and nearly half of all women don t know what they look like from top to down. Communication skills in social care Communication is all about making contact with others and being understood. This short guide will give you tips on how to communicate with the people you work with. Adult Education Advising Guidelines Adapted for Hopelink Adult Education purposes from the University of Maine Advisor s Handbook Introduction Good advising is more than meeting with students once a quarter. Be observant of and respond to the body language of your audience, if they look positive and engaged it will build your confidence.